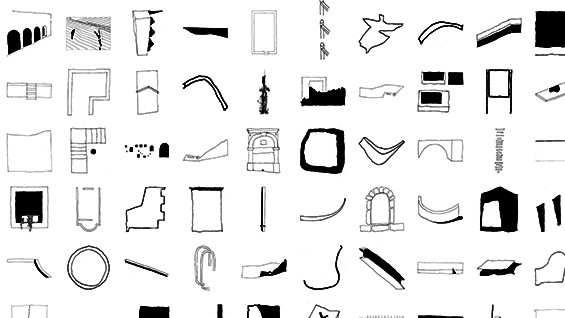 In this first of three articles featuring 2015 graduates of The Cooper Union [see parts two and three], we focus on three fifth-year students from The Irwin S. Chanin School of Architecture. 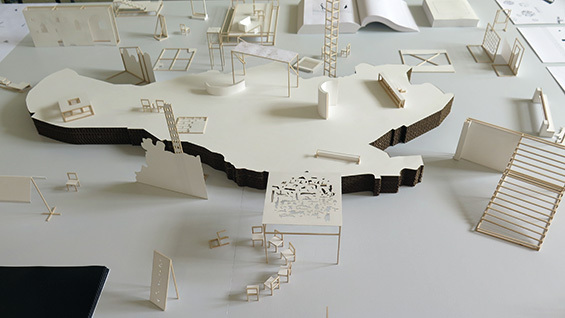 Their thesis work all shares an interest in the reclamation of memory in built form. Arta Perezic, Dustin Atlas and J.A. Alonzo searched landscapes, buildings, drawings and texts for sources that could give up secrets about the rich history of their thesis sites. Arta used photography to develop a set of pictographs to discover the cultural influences on a city in Montenegro. J.A. used Manila’s remaining tributaries known as esteros as the point of entry for understanding an unfinished plan for that city. Dustin imagined how a common element of city buildings—the fire escape—could be used to radically alter the function of a theater. We talked to each of them about their thesis proposals and their plans for the future. “A lot of my classmates keep a sketchbook; I keep a journal,” John Angelo, who goes by "J.A.," Alonzo tells us. J.A. has always used writing as a design tool. “For me, drawings and texts inform one another.” J.A. sees writing as another form of design. He writes poetry and recently won the Elizabeth Kray Memorial Prize, a writing prize given each year to a Cooper Union student, for a set of seven poems. “I’ve really gravitated towards the humanities department since my first year,” he says. 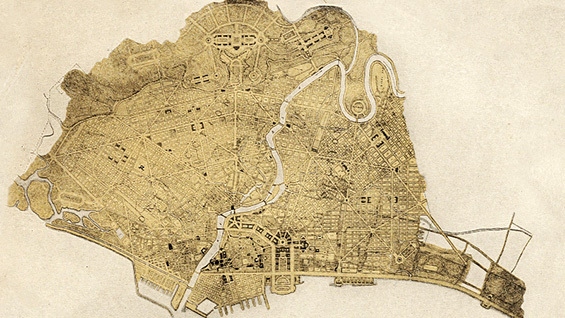 For his thesis proposal, J.A., who was born in the Philippines, analyzed the plan by Daniel Burnham, a renowned architect of the turn of the 20th century, for restructuring the city of Manila. That plan went mostly unrealized. But J.A. is particularly drawn to the project because, as a Filipino-American who grew up in Chicago, he wants to understand how the Manila plan informed the Plan of Chicago, Burnham’s 1909 comprehensive vision for the city’s development. Some of the preparatory work for his thesis project was done this winter when J.A. received a William Cooper Mack Thesis Fellowship to travel to Manila where he stayed with family he hadn’t seen for years. His proposal—which focuses on a network of river tributaries called esteros—offers him a clear way to think about cities important to his personal history yet through the lens of Burnham's work. After graduating, J.A. will begin applying for work at architecture firms in New York. Eventually he would like to attend graduate school to study either architecture or poetry. "Going to Cooper," he says, "allowed me to pursue both poetry and architecture not as discrete fields but as ones that mutually inform each other." With that in mind Dustin began researching the placement of fire escapes on theaters in New York. 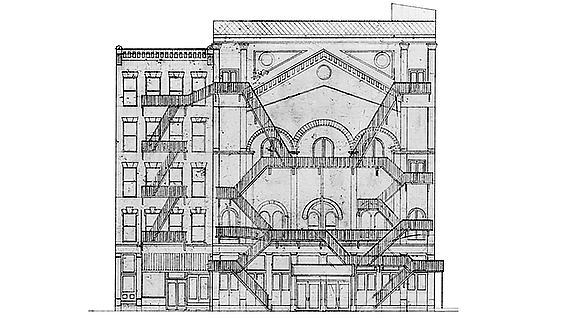 When he came across a drawing of Miner’s Bowery Theater, he was struck by the integration of the fire stairs into the design of the building’s front elevation. They are set at angles that play off of the pediment on the theater’s façade and, intentionally or not, mimic the crisscross support structure of the elevated train that ran along the Bowery. During further research he found out that the theater was greatly damaged in a fire on November 7, 1922. Dustin, who has been working with a Broadway set designer in his spare time, conceived of the fire as an inversion of the theater experience: the house of spectacle became a spectacle itself. At that point, Dustin decided that the physical manifestation of his research would take the form of a theater comprised only of fire escapes. 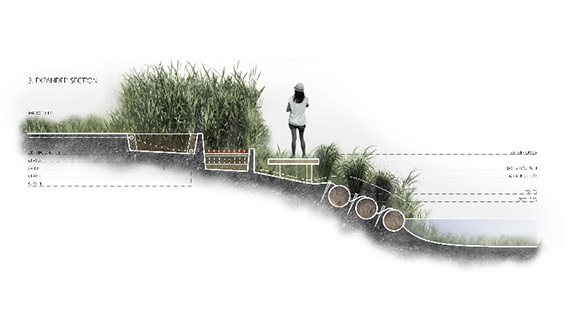 This armature would create an outdoor space at the former Miner Theater location that would blur not only the boundaries between actor and spectator, but building and city. Taking inspiration from Lina Bo Bardi’s Teatro Oficina in São Paulo, Brazil, he imagined a theater where the back-of-house is indistinguishable from its stage. Formally, this works particularly well since the iron members of fire escapes resemble theater scaffolding, which are often hidden. Instead, Dustin proposes a contemporary theater space that celebrates the industrial and mechanical structure of its own operation. While researching theater and theater architecture, Dustin read about the role of puppets and masks as mediators between audience and performer: instead of communicating directly, the audience and the actor meet each other in the space of the puppet. Dustin thought that a wall-less theater with metal scaffolding as the only threshold between theater and street would function as a liminal meeting place, much like a marionette. The walls would be manipulated by performers and audience members alike. 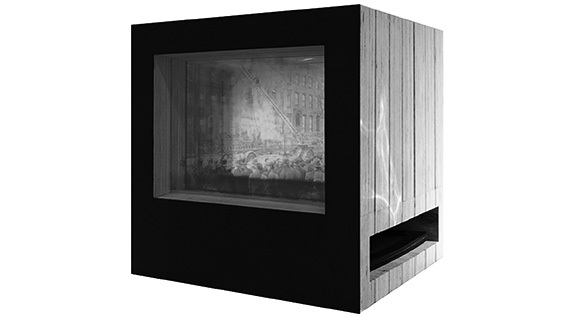 "I wasn’t designing a puppet theater but a theater puppet," he says.